You could make the argument May already was among the luckiest, with a charmed career that’s equal parts sweat equity and choking the life out of every opportunity that came along. He fell in love with comedy after performing at a church conference at age 13, and winning unexpected rewards. He turned professional at 17 when he opened for Sam Kinison after winning a contest as a dual-enrollment student at the University of Arkansas. Houston was a comedy Mecca at the time with seven clubs and a thriving, competitive scene. May could work all the time, and he did, also landing a radio gig that helped expand his reputation. He eventually earned a spot on the first season of “Last Comic Standing,” and though he finished second, he might as well have won (anybody remember who won that year?) with the way fans fell in love with his over-the-top persona. The raw, uncensored hallmarks of his mentor Kinison are evident in May’s set, laid out brilliantly over two hours in “Unruly,” recorded in front of a raucous, fist-pumping crowd of thousands in Atlanta. But May doesn’t deal in simple outrage, building a routine that’s rich, deep and fearless. He’s able to balance boyish charm, withering introspection and compassion for his fellow human being with some of the dirtiest, most honest observations you’ve ever heard. In the uncensored and unfiltered “Unruly,” he riffs on pop culture, race, his own excesses, the dangers of meeting Anderson Cooper and the mesmerizing deliciousness of Chick-Fil-A. With the increased visibility of the Netflix partnership, May hopes to fill the next 25 years of his career with even more breathless moments. Viewership expectations are high. May debuted five specials over a decade on Comedy Central with each drawing record ratings. He also tours extensively and has made 19 trips into war zones to perform for troops with the USO and Wounded Warriors charity. And his popularity continues to grow. He and his family split their time between Nashville and Los Angeles, where he has television development deals for an unscripted reality show with Ryan Seacrest Productions and a scripted series with Will Ferrell’s Gary Sanchez Productions. May is currently on tour in North America. 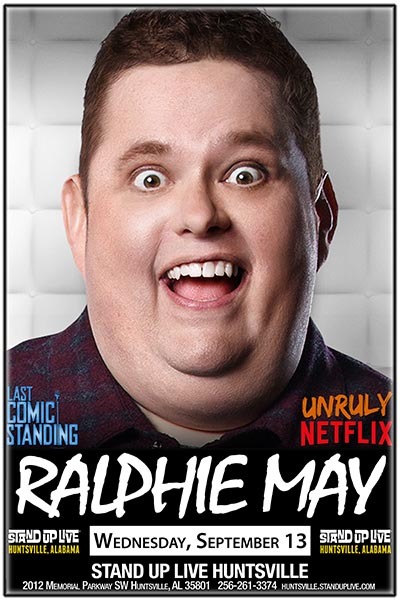 For more information about May or to buy tickets, visit www.ralphiemay.com.